Actually that was my intent but I had forgotten that January 1 would start the next Customfit sweater KAL — Deep Winter Sweater — meant to evoke (at least in my mind) thoughts of comfy, cozy, warm cardigan sweater that can be thrown on with jeans as well as work pants. 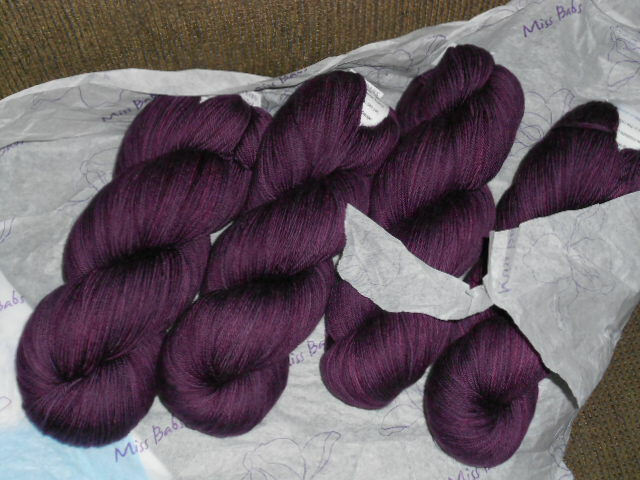 And since this lovely Miss Babs Yowza from her Christmas gratitude sale has been sitting on my couch since it arrived (whew – it arrived before 2015 so three days into the new year and I still haven’t purchased any yarn!) 😉 I decided I really wanted to make it into a cardigan. I love my other sweater out of Yowza yarn so can’t wait to get started. I’ve got one hank ready to start winding. You can see the link to the pattern I’m using on my Ravelry page (see the notes at the bottom – that’s where the link is since it’s a CF pattern) and what I’m really excited about are the buttons I have ordered. Since it’s a “deep winter” sweater, what could be better than “winter tree” buttons. The link to the button site is in the notes at the bottom too. I ordered them this morning and within an hour – maybe sooner – got the notification they were ready to mail. Talk about speedy. For those working on the mystery quilt – the last clue has now been posted. I’m going to wait until the Design Wall Monday post to show what my top looks like so I don’t spoil the “mystery” for those who are still stitching.